It’s a dove on a book on ornate drapery on a pillow on a throne. This throne simply hovers in midair, inside of concentric circles. From behind it come twelve beams of light. All of this is against a golden background made up of thousands of tiny mosaic tiles that flash light or dark gold depending on how the light hits them. It represents the invisible presence of Christ as the ruler and authoritative teacher. A throne prepared but not occupied would indicate this visually all on its own, and would invite meditation on the way Christ rules in his church even in this era when he is at the Father’s right hand, from which he shall return. Its emptiness does not indicate his mere absence, but his paradoxical presence as the one who is “with you always, to the end of the age” in one sense, and will come again in another sense. To drape that throne is to show reverence. To place a book on the throne is not to deify the Bible or to replace Jesus with text; it is to show that the ascended Christ rules, guides, governs, and “canons” his church through the prophetic and apostolic word. To place a dove on that book is to signify the Holy Spirit who manifested himself in the image of a dove at the baptism of Jesus in the Jordan, and who makes the authority of Christ present to us now since his outpouring at Pentecost. Throne, book, and dove signify the authoritative presence of Jesus the exalted Lord, without directly depicting Jesus. But viewed slightly differently, the prepared throne is also a very cautious allusion to the Trinity. 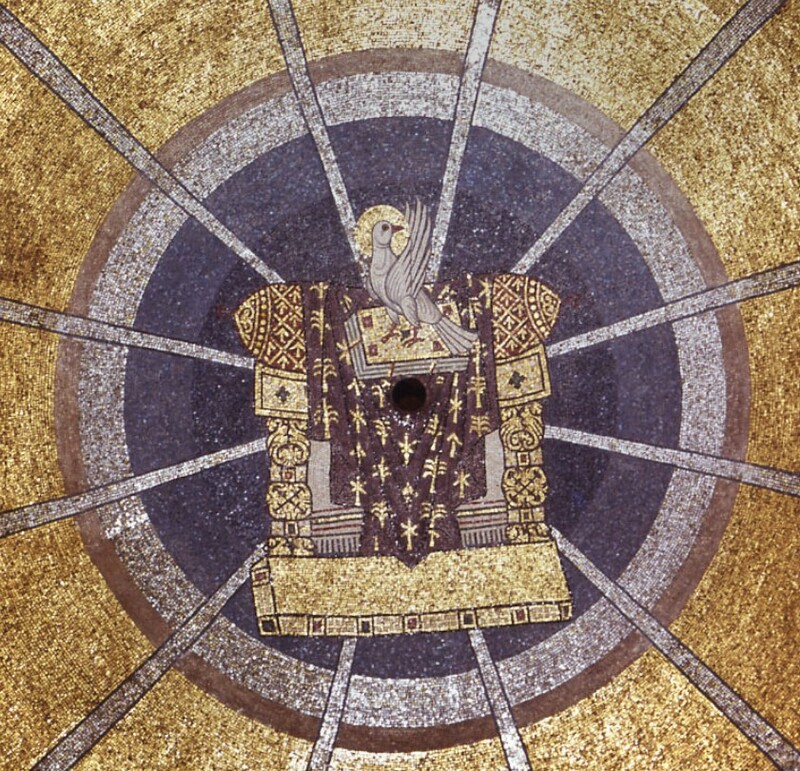 The throne represents the foundational authority of the Father, the book represents the Word of God, and the dove, again, represents the Holy Spirit. This may strike you as too subtle a way of signifying the three persons, since the Trinity is so obviously not a chair plus a book plus a bird. But if you take a minute to consider how ghastly and wrong all attempts at direct portrayals of the Trinity are, you may find your heart warming, like mine, towards this very oblique angle of approach. The prepared throne has also long functioned as a reference to the return of Christ and the final judgement. When he who is seated at the right hand of the majesty on high takes his seat and assembles before him all the nations, he will be present in direct, personal authority. That future reality is hard to depict from our point of view (again, you can paint it directly if you’d like but you’ll end up with mixed blessings like Michelangelo’s Last Judgment: clear and explicit but not credible). But a prepared throne is an excellent visual anchor for the recollection of Christ’s return. I believe all of these layered meanings go back into the early phases of Christian art; in some cases one meaning will dominate, and in others another. In St. Mark’s in Venice, the primary meaning of the image is actually yet another one: it refers to Pentecost. 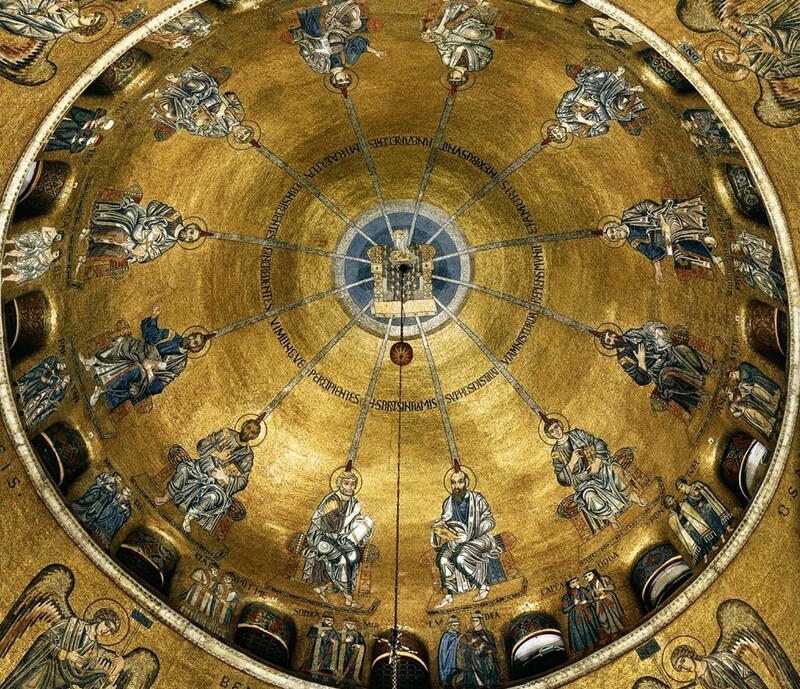 The throne in the St. Mark cupola is just the center of a larger image, too big and concave to ever photograph perfectly. It is an image of the twelve apostles being empowered and sent out to preach to all the nations of the world, as represented by those from many nations who heard them in their own languages at Pentecost in Jerusalem. The Spirit, in the form of tongues of fire, descends on them like a river. It strengthens hearts by filling them up and unites them with bonds of love. Following this, many peoples, seeing miracles and struck by the power of the Word, become believers. The middle-byzantine artists of St. Mark’s, somewhere around 1100, took the ancient image of the prepared throne and placed it at the center of a Pentecost scene. 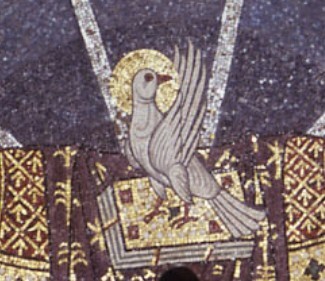 In terms of their handling of the imagery, this may account for why the dove on the book on the throne is so prominent, so big and birdy: He is visually holding together this complex image’s combination of a Pentecost reference and the Christ-Trinity-Judgment meanings of the central image. Taken all together, once you’ve had time to consider the various elements and levels of the iconography, it is a powerful focusing image for considering the mission of the church and, in particular it seems to me, the task of theology in service to that mission. Theology serves the church’s mission to disciple all nations by attending to the witness of the prophets and apostles in the power of the Spirit under the authority of Christ until he returns. Theology should hold the throne open (rather than sitting down there itself) and keep it prepared (rather than imagining Christ will not speak and judge from it).